Our experience tells us that boys learn differently from one another. For instance, some boys are inquisitive and enjoy asking questions. Others will tell you a story right away. Then there are tactile learners who love to handle, pull apart and manipulate things while they learn. What learning style is right for your boy? Our student-teacher ratio is less than 7:1, which enables us to work closely with your son to determine how he learns best, generate strategies when and where obstacles appear and extend opportunities for enrichment in his strength areas. Our mission is to inspire and and empower each boy through his formative years. We fulfill this mission by getting to know each boy and supporting him as he develops and discovers his own unique interests, curiosity and passion for learning. Through our emphasis on collaboration, we will also help him understand how to work with others who have different learning styles. At Sterling Hall, boys frequently work together in small groups and partnerships to enhance their learning, whether they are solving a challenging equation, brainstorming structural ideas or learning to read. Our teachers incorporate opportunities for collaboration into both curriculum and classroom design, with the knowledge that collaboration is central to best practices for teaching boys. 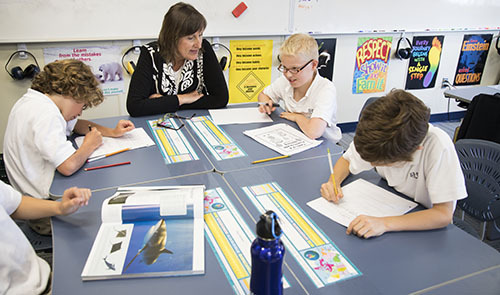 Small groups have been proven to be highly effective in a variety of learning situations and many of our classrooms are arranged in pods and small group stations for collaborative work. Assessment and evaluation of student learning are integral to supporting and improving the educational experience for each boy at Sterling Hall. Our assessment practices provide boys, their parents and teachers with clear achievement markers as well as learning skills and work habits required for sustained success. Our approach enables teachers to effectively guide, assess, evaluate and report on a boy’s progress. For more indepth information on our assessment practices, please click here.